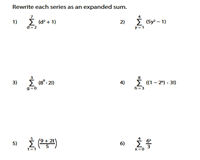 This set of general series worksheets contains various skills like representing the general series in expanded sum form, rewriting the series using sigma notation and evaluating the general series. Over 25+ printable worksheets are included. Read the sigma notation, plug in the index values in the formula, find the terms and write each general series as an expanded sum. 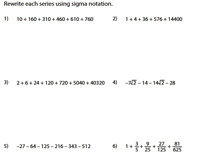 These worksheets feature exercises to rewrite the general series in sigma notation. 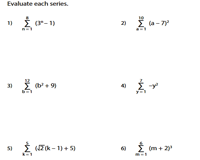 Observe the series and identify the general formula to translate the series into a simple summation notation. This bundle of worksheets has abundant exercises to rewrite the sigma notation with a modified initial index value. Change the general rule in order to maintain the number of terms of the series. 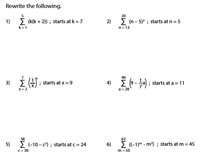 Check out the worksheets to evaluate the sum by expanding the expression. Find each term, then find the sum. 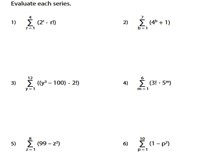 The general series worksheets here reiterate the concept of evaluating the series with varying difficulty levels.